In the match race to the Newport finish line of the Volvo Ocean Race's sixth leg, Dongfeng Race Team managed to fend off overall Volvo Ocean Race leader Abu Dhabi Ocean Racing to win the 5,177 mile leg from Itajai, Brazil by just three minutes and 25 seconds after 17 days, nine hours and three minutes of racing. Charles Caudrelier's Franco-Chinese team has led for the majority of the long leg north up the Atlantic but near came acropper as Dongfeng and Ian Walker's UAE team were neck and neck tacking up the west side of the exclusion zone, 10 mile short of the finish line with Abu Dhabi Ocean Racing slipping momentarily into the lead. The result for Dongfeng Race Team marks a fantastic turn-around after they were forced to retire from leg five when the top of their mast broke on the approach to Cape Horn. Caudrelier paid tribute to his shore crew who managed to fit the replacement spar in under a week in Brazil and prepare the boat for the next leg. Fortunately the indefatigable Kevin Escoffier (Mr Fixit) managed to make a repair that lasted. 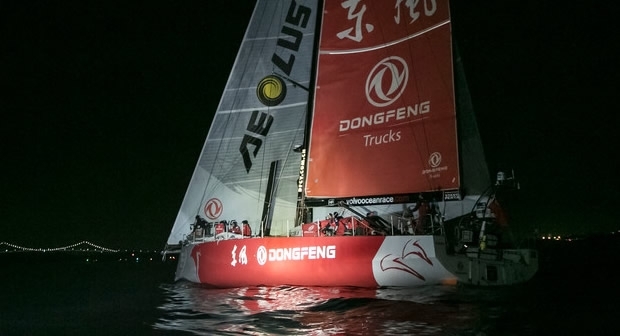 At the end of leg six, Abu Dhabi Ocean Racing still leads the Volvo Ocean Race overall, but Dongfeng Race Team's victory cuts her deficit to six points. Upon finishing, Walker paid tribute to Caudrelier's team: “We were within a couple of lengths of getting over them at Block Island - literally three or four boat lengths from rolling them - but they held on and dug deep. Very well deserved win." During the leg, Team Brunel took over the lead from Abu Dhabi Ocean Racing as the boats passed Puerto Rico. However, thanks to a collision with a large fish, Bekking’s team was unable to maintain this lead for long. “We suddenly heard a dull thud and our speed dropped immediately,” reported onboard media reporter Stefan Coppers from the boat. “A brief inspection showed that one of the two rudders had speared a big fish. We pushed the fish off the rudder with a spare batten. Unfortunately, the fish did not survive the collision.” In this part of the ocean, the team also had to cope with the problem of seaweed, which made sailing at night practically impossible. “We tried to keep the rudder blades and keel free from seaweed by manoeuvring and jerking the helm,” said Gerd-Jan Poortman. MAPFRE, with Xabi Fernández back in the driving seat followed Team Brunel home in fourth in an elapsed time of 17 days 10 hours 34 minutes and 25 seconds.